Some of these following wound dressing types have been use by Dr. Timko with excellent success for diabetic foot ulcers. Diabetic neuropathy can be a significant factor in causing diabetic foot ulcers. Only a few insurance companies reimburse for these expensive wound dressing types. Dr. Timko will explain details of the different wound dressing types and the benefits upon visit to the office. There is no particular order for these dressings. This page is for information only and you can click on each dressing to take you to the companies web page for more detailed information. Only four dressings or skin substitutes are FDA approved for diabetic foot ulcers and are noted under each one. They are Apligraf and Dermagraft and Oasis and MatriStem. Wound dressing types and skin grafts noted below are not in any particular order. 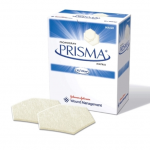 PriMatrix is a unique dermal repair scaffold for the management of the most challenging wounds. Derived from fetal bovine dermis, this novel acellular dermal matrix provides an ideal environment to support cellular repopulation and revascularization processes critical in wound healing. TheraSkin is a biologically active, cryopreserved real human skin allograft, composed of living cell, fibroblast and keratinocytes, and a fully developed extra cellular matrix (ECM) in its epidermis and dermis layers. Apligraf® is a unique, advanced treatment for healing. It is created from cells found in healthy human skin. Which explains why it looks like a thin, piece of real skin. 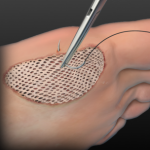 This graft is FDA approved for diabetic foot ulcers. 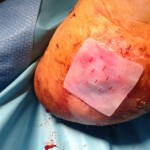 This graft is FDA approved for diabetic foot ulcers. See Video on how it works below. INTEGRA™ Bilayer Wound Matrix is an advanced wound care device comprised of a porous matrix of cross-linked bovine (cow) tendon collagen and glycosaminoglycan and a semi-permeable polysiloxane (silicone layer). The semi-permeable silicone membrane controls water vapor loss, provides a flexible adherent covering for the wound surface and adds increased tear strength to the device. The collagen-glycosaminoglycan biodegradable matrix provides a scaffold for cellular invasion and capillary growth. *Integra is no longer covered by medicare for diabetic foot ulcers. It is a great product and unfortunately the government has pulled the plug for diabetic foot ulcers. However, it is indicated for 2nd and 3rd degree burns of the body. One of the first skin regrowth medications that came out on the market about 13-15 years ago. It is also known as a platelet derived growth factor that is a catalyst to help growth skin and heal diabetic foot ulcers. It is not a graft, it is only a gel. It is applied on the ulcer twice a day with a moist dressing. The medication cost around $600 for a small amount. This dressing is a sterile freeze dried composite of 55% collagen and 45% cellulose. Works by reducing he amount of proteases and helps balance the wound to help promote a better environment and good granulation tissue. Basically the same as Promogran but 1% silver is added to protect the wound from infections. It is applied about every other day on a clean ulcer. V.A.C.® Therapy promotes wound healing through Negative Pressure Wound Therapy (NPWT). By delivering negative pressure (a vacuum) at the wound site through a patented dressing, this helps draw wound edges together, remove infectious materials and actively promote granulation. 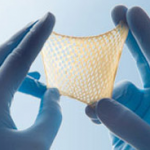 EPICEL is a type of graft made from the patient’s own skin. It’s called CEA, or cultured epidermal autograft. These grafts provide a permanent skin replacement for patients with deep dermal or full thickness burns. EPICEL is the only CEA approved by the FDA (Food and Drug Administration) and the only CEA product commercially available in the US. It has to be taken from patient’s own skin and grown for 16-21 days. DermACELL is a technologically advanced Acellular Dermal Matrix (ADM) that is used to treat diabetic foot ulcers and chronic nonhealing wounds. It is created from donated human skin. DermACELL’s preserved 3D architecture provides the necessary scaffolding to allow for cellular penetration and revascularization of the ADM into the patient. Grafix is a cryopreserved placental membrane designed for application directly to acute and chronic wounds. Oasis is a wound matrix that is a single layor structure for non-healing wounds. It is derived from porcine (pig) small intestine sub mucosa. It is applied by a physician usually once a week for up to 8 weeks. It is dry and has a 2 year shelf life. Must be applied to clean wounds. Same substance as Oasis but thicker by 3 layers. It is 300 microns thick versus oasis is only 100 microns. 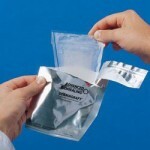 This wound dressing is an extracellular matrix is used as a temporary tissue substitute to advance the wound healing process and reduce contraction. The impact of applying extracellular matrix in chronic wounds is to restore normal cell-ecm interactions, kick-start the stalled healing process, encourage new tissue growth in the wound bed and epithelialization. 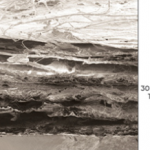 Graftjacket is a regenerative tissue matrix that is processed from donated human skin. 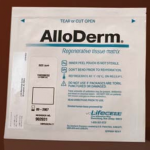 The allograft skin is minimally processed to remove epidermal and dermal cells through a patented method while preserving the remaining bio-active components and structure of dermis. The resulting allograft serves as a framework to support cellular re-population and vascularization. 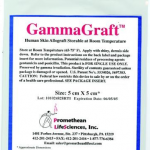 GammaGraft is an irradiated human skin allograft that may be stored at ambient temperature. 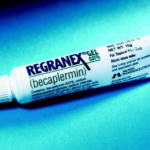 Its main applications are as a temporary graft for treating burns, chronic wounds, and partial and full thickness wounds. 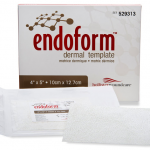 E-Z Derm® Porcine (Pig) Xenograft is indicated for use on partial-thickness skin loss, donor sites, skin ulcerations and abrasions. 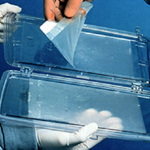 Donated human skin tissue supplied by US AATB-compliant tissue banks is aseptically processed using LifeCell’s proprietary technique to remove the epidermis and cells that can lead to tissue rejection and graft failure. The result is an intact acellular matrix of natural biological components that promotes rapid revascularization, white cell migration and cell repopulation, as shown in animal studies. 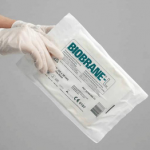 Biobrane is composed of a silicone membrane bonded to a nylon mesh to which peptides from a porcine (pig) dermal collagen source have been bonded to the nylon membrane to form a flexible and conformable composite dressing. Human Fibroblast Derived Temporary Skin Substitute, which is a temporary wound covering for surgically excised full-thickness and partial-thickness burns. It is mainly made of newborn human fibroblasts cells, but are coated with porcine (pig) dermal collagen. 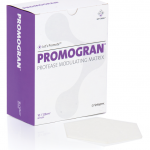 MatriStem devices are comprised of naturally-occurring porcine (pig) urinary bladder matrix (UBM). The bladder is harvested and processed to remove the muscle and submucosa tissue layers. 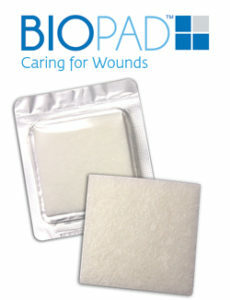 Biopad is an equine (horse) collagen primary wound dressing used to treat minor bleeding, open ulcers, and skin lesions. It has the highest collagen content of any dressing on market. I have not yet used this dressing, but it sounds promising and if you use a silver calcium alginate dressing over it then is can be a cheaper solution versus prisma. If you are a diabetic and have an ulcer on your foot, please contact us at feetdoc.com or call 1800-707-0215 as soon as possible to see if you would be a good candidate for one of these type of wound dressings or skin grafts.